The ED0806-01 is small, lightweight apochromatic refractor featuring an air-spaced triplet optical design and true diffraction-limited optics. This design virtually eliminates chromatic aberration and delivers razor-sharp, high-contrast images with excellent colour. 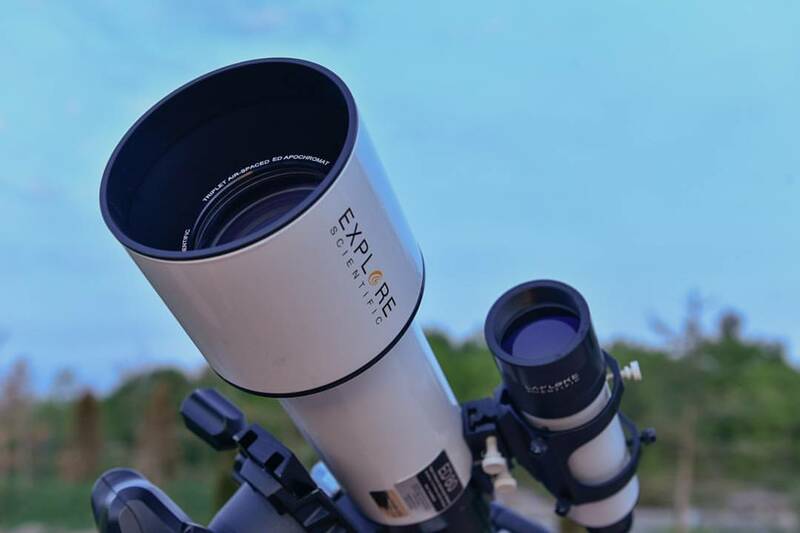 It’s quite unusual to see a triplet design in a price range where normally you’d find singlet or doublet designs, but Explore Scientific have managed to bring some pretty impressive optics to play for this little scope for a lot of performance while keeping the price affordable. On paper, this looks like a great telescope that delivers all that’s required for both visual and photographic use. Its specs are quite impressive. M81 and M82 – shot before receiving my coma corrector / field flattener. This image is cropped, but you can notice some coma and slightly softer focus in the corners of the image. The scope comes extremely well packaged in an attractive box. You don’t get a lot in the box, but you certainly get what you need and what you get is of good quality. You get the optical tube permanently attached to its Vixen-style dovetail mounting plate, 2 x 2″ extension tubes (to reach focus, you’ll need 1 extension if using for visual use, or both with a camera attached), and a 2″ carbon fibre diagonal fitted with a 1.25″ converter. While a very basic package, it contains everything you need except an eyepiece. Chances are if you’re buying this scope, it likely isn’t your first scope and you’ll already have eyepieces. You’ll also need to supply your own finder scope as it doesn’t come with one. Note that the mount is the Meade-style mount, so most standard dovetail finder scopes won’t fit. If you have to buy one, buy an Explore Scientific model (preferably a right angle finder) vs a Meade, as the ES finder is of significantly higher quality than anything Meade has to offer. You won’t regret it. Overall, construction seems solid with a great finish. The metal objective lens cover fits snugly without slipping off. Everything was solid out of the box. The focuser was nice and smooth. The real star here is the diagonal. The carbon fibre construction not only looks great, but is extremely lightweight for something so large, weighing in at about the same as the 1.25″ diagonal that came with my Meade LX90. The diagonal also features compression rings rather than screws to hold your eyepieces in place, so you won’t marr your eyepieces using it. While there’s technically nothing wrong with the scope, this is where things could have been done better and a few places where corners were cut to keep the price low. None of these will impact the user significantly, but they do need to be pointed out. The “foot” Vixen dovetail mount is attached to the scope via a pair of hex bolts and a small riser block. The spacing between the dovetail and tube is too small. This results in not being able to push the scope far enough forward in my mount’s saddled to properly balance it on the declination axis once a camera is attached. Moving it as far forward as I can, it also blocks the focuser rotation (for image framing) from being able to be rotated more than a few degrees in either direction. I tried on 2 other mounts and found I had the same problem. Fortunately, I have a lightweight camera (Nikon D5100), so declination balance isn’t a big issue. But an extra 2cm of height on that riser block here would make a world of difference and allow proper balancing. After a couple of initial uses, I found that the hex bolts that hold the dovetail plate on the scope started coming loose. I tightened them up, only to have them loosen up again after a couple more uses. It would appear there’s a slight issue here with the allowed tolerances for the threading. I easily and permanently solved this problem by putting in some semi-permanent thread lock on the bolts before re-inserting them, but I shouldn’t have had to do this. While accurate and smooth, the focuser has a very “spongy” feel to it and is not as responsive as I’d like. While I’ve never had any real issues focusing, this spongy feel results in it taking more time to focus than is necessary. You’ll have to tweak the knob back and forth a lot to get perfect focus, as there’s a delayed response to your action, making it feel less accurate than it should. Without having the second 10:1 knob, I feel precise focusing would be nearly impossible. It’s not a show stopper, but it’s something that definitely could have been done better. Once focus is achieved and the drawtube is locked into place with the thumb screws, it holds focus accurately over an entire imaging session. The focuser also rotates for framing of your image. While this is a great feature on paper, its implementation is rather poor compared to other focusers that have this feature. Loosening the lock nuts causes the whole focuser assembly to wobble in the scope tube. Tolerances for the machining here are very poor. It feels very rough when you rotate it, rather than turning smoothly. And there’s a good chance that once you lock it back down in its new orientation, you’ll need to tweak the focus again. The machining for these parts doesn’t seem to be of very high precision compared to the rest of the telescope’s build. You’re much better off loosening the compression ring attaching your camera, rotating the camera and tightening it back up than you are using this feature. Keep it locked and well-seated and it’s not a problem. None of these issues are serious or cause any real problem. These things just could have been done better. This is one area where this scope definitely does not disappoint. For visual use, it produces bright, sharp images with potentially gigantic fields of views with long focal length eyepieces. Views of the moon are clear with great contrast and no chromatic aberration at the edges, even at advanced stages when the moon is very bright. Deep sky objects within its reach show fantastic contrast. My first view of M31 with my 40mm eyepiece was nothing short of breathtaking. It could easily resolve dust lanes, M32 and M101. It was by far the best view of M31 and its companions I’d ever seen. At higher powers, the rings of Saturn pop out. The Cassini division is clearly visible and some subtle banding is visible on the planet’s disc. Jupiter was a fine sight. The bands were clear and sharp and the Great Red Spot stood out clearly. I’m used to seeing the planets with my 8″ SCT and my older 120mm f/5 achromatic refractor. While this scope can’t resolve the finer details as well as those larger instruments can, it was still a very impressive sight considering the small aperture and short focal length. The colour and contrast produced was just unmatched by those larger scopes. This scope has also become a favourite for shooting the moon. Be it with a DSLR or my lunar imager (ZWO ASI120MC-S), it delivers incredible images and reveals subtle detail that only my larger 8″ SCT can come close to matching. The contrast on the fine surface details is far more pronounced on this scope, despite the higher resolution and power of the larger instrument. I can’t get the super high power views of the moon that I can get with an 8″ instrument, but the quality of the images is unquestionably superior. One thing to note is that if you want to use this scope for photography, a coma corrector / field flattener is a must. While you may have perfect focus near the middle of your field of view, focus at the outer edges will be soft, and you’ll notice some mild comatic aberration. Most telescopes will have a curved focal plane and comatic aberration, particularly short focal length refractors. You may be able to get by for visual use without one, but if you intend to use this scope for photography, then expect to shell out another 150 USD for the flattener. The image posted above of M81 and M82 were taken before I got my coma corrector / field flattener (it was on back order). While the image is cropped, you can see some comatic aberration in the corners and the focus isn’t as sharp at the edge of the field of view as the center compared to my other images that have a perfectly flat field and are free of all coma. At the time of writing, I’ve owned this telescope for almost 7 months. I’m a bit lazy when it comes to setting up my normal kit for photography, so it’s been my #1 telescope since I got it. This scope’s small size and weight make it an ideal “grab and go” scope. Its short focal length and fast ratio make it very practical to use without requiring an auto-guider, laptop, or other equipment to use effectively. I just set up on my Celestron AVX, attach my camera with an intervalometer, and after alignment, I can pull off 2-3 minute exposures without trailing. Its wide field of view is very forgiving with a DSLR attached, particularly if your camera has a full frame sensor. It’s been a joy to use in every sense, despite it’s few minor shortcomings. It’s allowed me to capture some of the best images I’ve ever shot and without a doubt is the finest instrument I’ve ever had the pleasure of using. The scope comes with a full 1-year warranty from date of purchase. One very notable exception is for collimation. Collimation of such an instrument is a delicate task that’s not easily achieved. Explore Scientific offer FREE lifetime collimation service for this telescope should it ever need it. Shipping is at the owner’s expense, but they’ll do the work for free. This is a rather sweet deal! While I highly recommend this scope, I would encourage that if you can afford the extra 300 USD, the 102mm version is a much better buy and the issues I’ve pointed out with this scope aren’t present on the larger model. If you have any questions or comments, please feel free to post them in the box down below.